Super Bomberman R serves up the perfect compliments to the single player adventure that Zelda offers on the Nintendo Switch. Offering hundreds of hours of retro game play both online and offline, Bomberman R is not a game you will get board of anytime soon. Bomberman R’s Switch debut is its first appearance, on any format, in 6 years. And this sequel to 33 year old franchise is a triumphant return to the multi player shenanigans that made Bomberman the multi player favorite it is today. Published by Konami and developed by HexaDrive, Bomberman’s development has been in good hands. The konami appointed dev’ team, HexaDrive, has given the history of Bomberman a warm manly embrace while introducing fresh and exiting new ways of applying and mixing up the trusted top-down formula. Hexa’ keeps everything that made the Konami great such a fan favorite. Opting out of lavishly transforming the game play, Bomberman R still tasks players with the simple objective of moving around a 2D area grid map. All while attempting to trap their opponents and bomb them out of existence. It’s all very simple. Its all very retro. It’s proper Bomberman game play all present and oh so beautifully correct. Hexa’ haven’t fudged this. It is still old school gaming brilliance just with a new set of fancy cloths. But in all the ways that Hexa’ have tampered with the formula it has done so with deliberate additions being careful to preserve the Bomberman mix. If you want a 21st century Bomberman, this HexaDrive rendition is the best you are going to get. And one of the notable areas that Hexa’ has extended upon is the feel of the characters and enemies in the game. Plenty of the the original Bomberman cast return renewed for this Switch rendition. But, in keeping with Hexa’s drive to push the game to new heights, the characters not only sport new looks but also an all star cast of voice talent to bring them alive. And what could have been a throw-away, tedious and embarrassing script turns out to be genuinely entertaining and often laugh out loud funny. To the point where the interaction between Bomberman brothers and the enemies they banter with on their travels will be drive enough to push you through the sing player story. And these new enemies haven’t only been imbued with a new script. They each have distinct in game AI to give them unique personalities. It makes each of them challenging and engaging to play against. Almost to the point where it’s as if you are playing against a human opponent. You actually start caring about the characters. A strange thing to say about a Bomberman game but they are so endearing, so humanized that it makes the single player story that Hexa has concocted a memorable and enjoyable experience. One that I would quite happily play through again and more of which I will discus later. But for now I want to jump right into the the presentation of the game and look at how Bomberman R keeps all that makes it a retro classic intact while being up-to-date for modern eyes. Bomberman captures the essence of all this and updates it creatively with a caring eye on the Bomberman heritage. A techy cherpiness to the sound score is welcome. A constant and ever present reminder of the retro roots Bomberman thrust up from 3 decades ago. And this retro redux also translates to the look of Bomberman R. HexaDrive have taken the 2D stages and updated them. Lavished them in graphic treats that include real time shadows, 3d destructible environments and a real time light system. All of which plays out a in a neon-esq photon show, that lives and bleeds the retro look. It’s as if Hexa went back in time to the 80’s and brought pixel artist back to the future. The retro look captured perfectly using modern standards. And, in addition to these new 3D looks, we get a new camera system. Inclined at a slightly isometric angle, Bomberman R’s new appearance is plain for all to see. And all without taking away from the immediacy that a top down 2D presentation offers. But the camera can, on the rare occasion, throw up some unfortunate oddities. For example, because of the angle the camera shows you the stage, sometimes your Bomberman character can get hidden behind some of the larger story mode bosses. Making for difficult hair raising moments when you don’t quite know exactly where you Bomberman is which often leads to untimely unfair deaths. Additionally the story mode, which I will talk about more in the next section, can be played in cop-op. But the camera can struggle to fit both characters on screen when they split apart. The levels are often larger than what can easily fit on the screen. This sometimes leads to moments of ‘tug-o-war’ where each player is running up against the edge of the screen, in opposite directions, unable to progress further. This often ends in both players suddenly and unfortunately losing a life. Apart from this small issue with the camera, Hexa’ have done a wonderful job of updating Bomberman R’s presentation for the Nintendo’s new console. And talking about the Switch, Bomberman R makes good use of everything Nintendo’s new hardware has to offer. For starters, the game renders out at native 1080p on Tv and 720p on the Switch screen. And all of this native resolution goodness comes at a constant 60fps which makes the game a joy to play. And talking about joy, the joy-cons are put to great use. Each pair splitting apart to give a mini controller that, in co-op or multi player, each player can use. Giving you 2 controllers to play together strait out of the box. 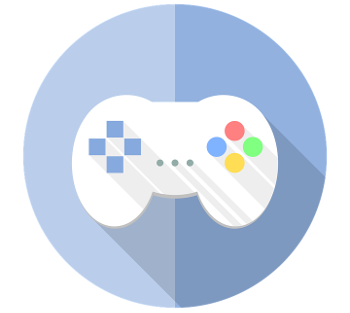 You can play 2 player co-op story mode immediately or enjoy a bout of 1-on–1 multi player without ever having to buy a second set of controller. But if you do want to buy more sets of joy cons, the Switch will let up to 8 players join in to bomb each other into oblivion. All huddled together in the same room, playing on the one switch. And continuing on to the story mode, Bomberman R introduces a comprehensive campaign that stretches on for 50 bomb-tastic action filled stages. Each offering up unique challenges and environments. These 50 stages are split up into groups of 5 which are set on different planets. Each of which are themed with different graphics, enemies and sounds keeping the player constantly on their toes. And if that wasn’t enough, at the end of each set of 5 stages there is a boss the player must face off against. These bosses are both varied and interesting to fight, breaking up the normality of the Bomberman game play. Requiring you to constantly adapt tactics and strategy to new systems and patterns. These boss fights can be quite hard on your first encounter. But they serve the game well to break up a repetitive game play pattern. Coming along just as the levels of each themed planet get tired and boring. And the story mode acts as a means to open up extras for the multi player mode. For every level you complete, you get money to spend. This currency can be spent in the self styled Bomberman shop to buy new goodies such as multi player maps and characters. Or the digital cash can be used, less extravagantly, to buy your way back in to a certain level if you die to many times and are greeted by the game over screen. That said, the main story, on the easiest difficulty setting, is quite short and can be completed in just a few hours. But the beginner difficulty is just that. Any gamer with even a little bit of experience should start on normal. Speaking of which, the game offers up a drop of replay value by offering a further 3rd and 4th difficulty: Hard mode, which is open from the beginning and a very hard mode which you must buy. In these harder modes, the game gives you less lives and makes all the enemies move faster and more aggressively. Additionally you get less money to buy things in the shop. Counter intuitive as you would think you would get more of a reward for completing levels on a higher difficulty. 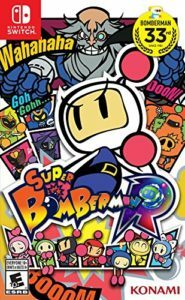 But once the fun of single player has worn off, and that will take some time, you can dive into what makes Bomberman such a an enduring much loved franchise: Hectic multi player combat. Bomberman R gives you the chance to compete with up to 8 players both locally and and online. You can play in a number of different area’s, more of which are opened using the in game shop. And each offering a unique opportunity to blow your foes to smithereens. The multi player has a number of options to tweak the game play to suit you and your friends. These include playing in different areas. Selecting random or fixed spawn points. Game length. Suffice to say, the option plentiful and depth-full and offer a lot of scope for personalization of your matches. All the normal options you expect for a multi player game of this kind are included. The 8 player multi player is a truly welcome addition. Taking advantage of all the opportunities the Switch hardware has to offer and what Nintendo’s new Online infrastructure delivers. The online aspect, though hugely entertaining and welcome, is still in its early stages. Whether it be down to Bomberman or Nintendo’s online system, there is a small amount of lag when playing across the World’s network. Though, this is not a deal-breaker, as I expect this to be eradicated by the time you read this with a forthcoming patch. But it’s the local co-op where Bomberman really shines. With enough joy-cons split into separate mini controllers, 8 players can squish around a single TV for some gaming fun. It’s really what the switch is all about. Games helping people come together. Bringing back epic, in person, multi player moments that I thought were consigned to gaming’s history. Throw in a few beers and you have yourself a real retro gaming party. I can’t stress enough how good it is to see couch multi player still alive, kicking, and in such good health with Bomberman R.
So, whether you’re playing against people in the same room or from another continent, you will get a great multi player experience. Bomberman R’s intense multi player action moves across perfectly to the Nintendo Switch.It’s colorful retro gaming action a welcome diversion from the all encompassing time sink that is the single player only Zelda. If you want the perfect counterpart to Link’s magnum opus, Bomberman R should definitely be in your collection. So go get a copy before they all sell out our miss out on this multilayer gem! Stay up to date with all our shenanigans!